occupied nests' of waterbirds from heronries throughout the UK. Population changes for most of the UK's common breeding birds are monitored through transect counts for the Breeding Bird Survey. Colonial species are covered relatively poorly by BBS, however, because breeding is concentrated into such small areas. Heronries are the places where Grey Herons, Little Egrets and sometimes other waterbirds gather to nest. Nesting often persists for many decades at the same location and becomes very well known to birdwatchers. Grey Herons in particular are monitored efficiently and accurately by counting 'apparently occupied nests' in their heronries. The BTO's Heronries Census has gathered nest counts annually since 1928 at an increasing proportion of the UK's heronries. We aim to count as many heronries as possible each year and to ensure that newly established sites are quickly discovered and brought into the programme of annual counts. The main species covered is Grey Heron but Little Egret is fully included, as are rarer species of colonial waterbirds such as Cattle Egrets (which nested in the UK for the first time in 2008). Nest counts of Cormorants are also collected, especially where they are nesting alongside herons. Data are shared with county recorders and for rare species with the Rare Breeding Birds Panel. The long history of the Heronries Census has been interspersed with periodic Heronries Surveys which have expanded upon its coverage in particular years. Heronries Surveys (of varying aims and scope) were undertaken in 1928, 1954, 1964, 1985 and 2003. The count data from all these surveys are integrated fully with the Heronries Census database. We are undertaking another Heronries Survey in 2018. You can view our vacant site map for heronries to see if there are any known vacant heronries in your area and contact the Regional Organiser to express an interest in the survey. 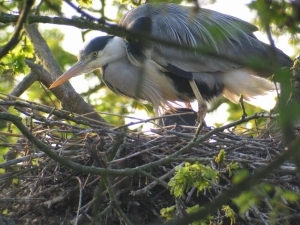 We may not know about all heronries, so if you find a colony of nesting Grey Herons or other waterbirds and suspect it may not be known to the Heronries Census, please report it to us using the vacant site map. You can also contact us to make a general enquiry at herons [at] bto.org. Once you have contacted the Regional Organiser (RO) and agree to cover a colony, they will be able to allocate it to you so that you can input, view and edit your Heronries Census data online. Read more information on taking part. Note that if you are not yet registered for BTO online surveys you will need to register before the RO can allocate a heronries site to you.